How Congress Can Stop A Nuclear Deal With Iran : It's All Politics As President Obama unveiled a framework of a deal with Iran on its nuclear program, Congress was out of town. Next week, they're back and could prevent sanctions from being lifted. 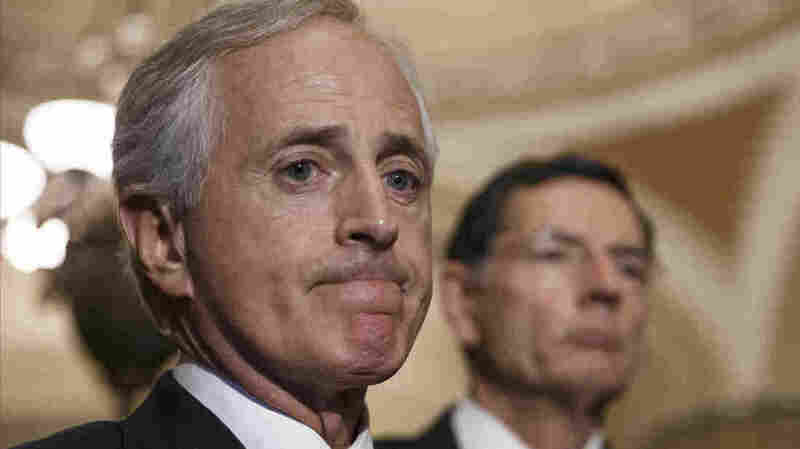 Sen. Bob Corker, R-Tenn., chairman of the Senate Foreign Relations Committee, will shepherd bills on Congress' reaction to the Iran framework deal struck by President Obama. Congress was out of town, and, to some extent, out of the loop when negotiators in Lausanne, Switzerland agreed April 2 on a "framework" for a deal that U.S. officials say would keep Iran from building a nuclear bomb. As the details for a final deal get worked out before a June 30 deadline, the White House would just as soon see Congress stay on the sidelines. After all, administration officials argue, this is an executive agreement, not a treaty — so it needs no approval by the legislative branch of government. Not surprisingly, the Republicans in charge of Congress disagree. So do many Democratic members. On Tuesday, the day after Congress returns, that disagreement will be on full display when the Senate Foreign Relations Committee debates and votes on a bill titled "Iran Nuclear Agreement Act of 2015." That bill is no small order. For starters, it instructs President Obama that he has five days "after reaching an agreement with Iran relating to the nuclear program of Iran" to submit the text of that agreement to the appropriate congressional committees. There's more. Obama must also include what's called a "verification assessment report" to be prepared by his chief negotiator, Secretary of State John Kerry. That document would have to detail how much Kerry can verify Iran's compliance with the terms of the agreement. The president would also have to submit an assessment of the adequacy of safeguards meant to insure Iran does not pursue making a nuclear bomb. Beyond that, Obama would have to certify to Congress — within five days of an agreement being reached — that it details all the terms regarding Iran's nuclear activities, as well as any sanctions to be waived by the U.S., other nations, and the United Nations. All of which raises a question: to which "agreement" does this bill refer? Is it the framework reached in Lausanne, an agreement Obama compared on NPR to signing a contract on a house, but with appraisal, inspection and mortgage details yet to be worked out before the deal is closed? The president clearly sees that document as a work in progress. "The devil is in the details," Obama told NPR's Steve Inskeep, "and over the next two to three months, we are going to be in a very tough series of negotiations to make sure that the mechanisms we've set in place actually work." The bill being put to a vote by the Senate Foreign Relations panel is mute on which agreement — preliminary or final — it addresses. But staffers with both Republicans and Democrats on the committee are categorical: the legislation, they tell NPR, is about a final agreement. That is, one that likely would not be reached until the end of June. "There will be no congressional action on the bill itself," one top aide said, "until after a final agreement has been reached." Only then would a 60-day congressional review period called for in the bill begin — a period during which the president would be barred from waiving any sanctions while Congress debates and votes on the final agreement. If lawmakers vote to support it or end up not voting, Obama would then be free to waive executive sanctions and those congressional sanctions that provide for a presidential waiver. If Congress votes against the agreement, and if it's able to muster two-thirds majorities in both chambers to override a presidential veto, no sanctions could be waived — which would doom any nuclear deal. It's not clear just when such a vote might take place. If Congress sticks to the proposed 60-day timetable for acting on the agreement, it would, at the most, have only four weeks before the August recess begins. And those 60 days would have expired by the time it returns in September. The length of the congressional review period could still be changed, of course. But everything suggests there may be a lengthy period of congressionally generated uncertainty following any final nuclear deal. Before then, Congress appears certain to vote on the Iran Nuclear Agreement Review Act — it has broad bipartisan support. But as one GOP aide puts it, "This is not a vote on the nuclear deal itself. It's a vote on what Congress will do once there is a deal." And while Congress lacks the legal authority to reject that deal by itself, its power to withhold sanctions relief for Iran means that, for the White House, Capitol Hill no longer can be relegated to the sidelines.